A robust imagination can exacerbate anxieties and project Technicolor nightmares; but it can also do things like dream up a novel. In Stephen King’s case, it can churn out novels like a PEZ dispenser (novels which, incidentally, are often not unlike Technicolor nightmares). When I attempted my first novel, I thought all I needed to succeed was a fine imagination. Perhaps my experience in theatre and improv would help with character work, plotting, tone, and such … but mostly it would come down to my ability to make stuff up. Armored with this hubris, I sat down to … you know … make something up that would eventually become a delightful, inspiring, riveting novel for children. My method was as follows. 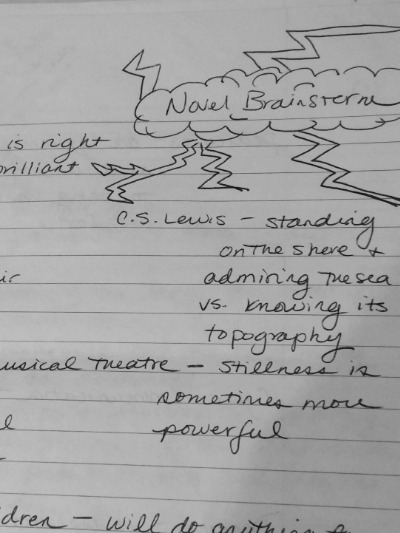 Write “Brainstorm” at the top of a sheet of notebook paper and draw cute clouds with lighting bolts around it, like I’ve done before starting any project since the seventh grade. So far so good. Below said Brainstorm, write all the things that have influenced me in the first twenty-three years of my existence. Such landmarks include reading Mere Christianity, growing up in a large family, musical theatre, and my childhood dog, Wally the Miniature Schnauzer. Apply some of these things to the life of a character -- a protagonist in a large family who loves to dance and is nannied by a talking schnauzer. She stands on the edge of her kingdom and looks out over it, not knowing what trouble is really brewing there. I thought of an opening conflict: her fiancé done her wrong. It might be different to have an ingénue begin her story already engaged, said me to myself. I started writing. I discovered the world around me while I wrote, having my protagonist look out over the kingdom so I could get my geographical bearings, meet characters one by one so I could get to know them, and introduce about a dozen conflicts all at once because they would all sound so mysterious! (a talking crow seems to know all about her strained engagement, there are bandits raiding the villages, the queen has been missing for months, older sister seems to be hiding something …) Who cares how they get resolved? Imagination! I’ve gone back to the original, hand-written first pages of Tess and the Trinket (then titled “The Forgotten Queen”) and they're not bad. The problem was I set my novel in a world with magic and talking animals, but I didn't know the rules under which that world operated. As I wrote, I kept painting myself into a corner. So the story didn’t start in the middle of things, it started at the very beginning of me thinking it up. I wrote these first pages sitting by a pond on a beautiful autumn day. In my mind, there was no end to the gold I could spin. My second problem was to edit as I went. 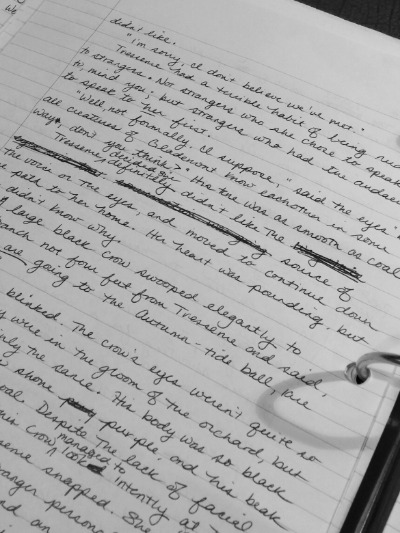 I never had a true first draft, because I would outline a chapter, read it over, and alter it beyond recognition before moving on. The result was a year-long process of writing and unwriting. And in the end, I still didn’t have a polished product. In fact, as soon as I finished the first draft, I started all over again! I haven’t stopped pulling the darn thing apart since two Junes ago, and so the story never had a chance to gel. At first I accused myself of a pallid imagination. But, after reading Stephen King's On Writing, I think I never gave my imagination a fair shot. According King's "Memoir of the Craft," the process should go a little more like this. Come up with an image that hooks. Write the first few pages, putting that image into a world. Take some time to look over those pages and assess whether there is any potential in them. If so, please move to the next space. Sit down every day in a room with a door, close that door and write for a solid three hours or more. Don’t tell anyone about the book; don’t risk the damage their reaction might do to your writing. Bang out the book, ideally in three months. No note-taking or character sketching necessary. It’s all in your head as you write in one great flash. Hence, the imagination percolates without interference. Put the manuscript in a drawer and let it simmer for at least six weeks. In the meantime, start another project. After the allotted time, you may pull the MS back out and read it with a pen in hand (blue, I believe?). Ideally in one sitting, or in as few as possible. Door closed, of course. NOW you can show it to a handful of trusted readers and receive their feedback for a final “polish”. Get back to the Daily Planet before your lunch break is over, and avoid kryptonite. But I like notes! I like outlines! And clearly I can’t just wing a novel by virtue of sheer focus. SO I shall take Stevie’s advice and bastardize it until it looks more like this. Come up with an image or premise that hooks. Compose a tagline, summary paragraph, and full synopsis. Write character profiles for the main characters, quick profiles of minor characters. Outline the whole bloomin’ thing scene by scene. Look over all of the above for plot holes or inauthentic character choices. THEN write at my desk for three months with the front door closed (no one is in my house during the day but the dog, and he whines if you shut him out) and not tell anyone about the project. Let it sit for six weeks while I query the bejeezus out of Tess and the Trinket. Send to trusted readers for their feedback. There you have it, my new game plan. Special thanks to SIL Hartley for a fantastic birthday present! I don't think I'd be Mr. King's friend in real life, but he sure is a heck of a writer. Did I mention I’ve started a new novel? No – you can’t know a blessed thing about it. Except that it’s nothing like Tess and the Trinket. And it may be inspired by Newsies. I won’t say another word!